Omega Batteries and Omega Battery replacement in Los Angeles! Battery installation for Omega watches in Marina Del Rey! We provide Omega Battery Replacement in Marina Del Rey, California. Marina Bay Watch Company has the proper training to handle all your batteries for your Omega watch. It is our priority that when replacing your battery on your Omega, that it will maintain its water resistant properties and still meet factory specifications. Our technicians follow a critical procedure of steps in changing your battery properly including gasket replacement and water testing. We provide Omega battery replacement services on every quartz model made including: Constellation, Speedmaster, Planet Ocean, Seamaster, De Ville, Double Eagle, Aqua Terra, and many other quartz models. When your Omega battery is going bad it will start to lose time. While at other times your watch will keep perfect time, but the second hand will occasionally jump in two to five second intervals. This can be a major indication that it is time to replace your battery. The last and most obvious sign that your battery needs to be replaced is that your Omega will just completely stop. The first thing our technicians will do is analyze your Omega to distinguish immediately the proper tool required to replace your battery. This picture illustrates an Omega Constellation watch in which the back pops open with a special blade. Once we have identified the correct tool to open the case, your Omega case back will be carefully removed. This picture illustrates an omega that requires a special screwdriver designed to aid in a battery replacement. It is imperative that when removing the battery to not get any fingerprints or dust anywhere inside. Once we confirm your Omega is ticking and moving, we are ready to go through all your gaskets and water testing. If your battery leaked from sitting around or your Omega just needs additional service, we can assist you. 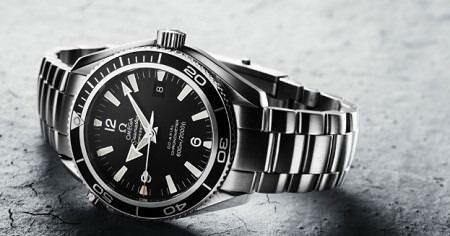 This stage is the most crucial step when replacing a battery on an Omega to ensure the water resistance. After confirming your watch operates with a new battery, all the gaskets are sealed (or replaced if necessary) prior to water-testing. For more information about water resistance and a breakdown on the process, please visit our page which talks about this thoroughly. Come visit us for your next Omega battery replacement!